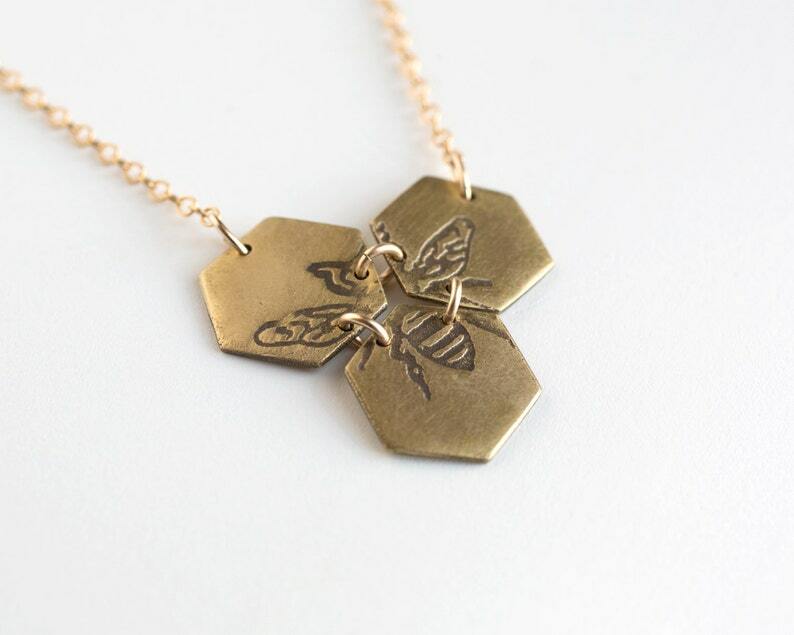 This necklace features a honeybee on 3 small connected hexagons. I etched the honeybee design on to the original copper hexagons using ferric chloride and different resists. Then, I made a mold so I can now cast this piece in any metal you like! This listing is for a brass pendant with a brushed matte finish. Each piece is sealed with a clear fixative on the back to prevent oxidation, and also to protect sensitive skin. Pendant is about 1" across, on a 16", 18", or 20" gold-filled chain with lobster clasp. Convo me if you would like a different length chain. Model is wearing the 18" length. Would you like a special message on the back? Engraving is available for $14 per hexagon, up to two lines of words. (They are tiny so only a few characters really fit- think names and dates) Please allow 3-6 additional business days for engraving. Please leave a note to seller at checkout with the exact engraving you would like on which hexagon, and any font requests as well. I will contact you if we need to discuss engraving placement.